Enjoys a cool but sunny location. 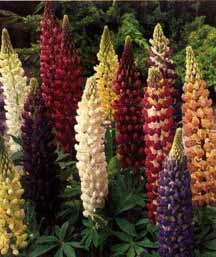 Lupines tend to be short lived but may self sow. Division not recommended. Russell lupines provide some of the grandest flowers of the season. The blossoms come in shades of blue. white. yellow. red. and pink and are tightly set on spikes that range from 2 to 4 feet high. They do well planted against a wall or fence that will provide support against winds. Staking is helpful in more open areas. Space Lupines at least 18 inches apart - they should not be over-crowded. Good air circulation will discourage problems with mildews. They prefer a soil that is slightly acidic. An annual application of bone meal will enhance flowering. Lupines live for about 4 to 6 years. The plants should not be moved or divided as they have a long taproot and resent being disturbed.